Manufacturers usually invest money, time and effort in checking the quality of the products they manufacture. Select one of the products below and describe how you think the manufacturer checks the quality of manufacture, to ensure quality standards are reached. 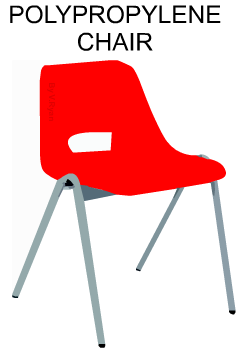 A standard answer for a Polypropylene Chair has been included. This may help you answer your selected product. The chair will be checked for stability. It will be checked to ensure that under normal use, the chair will not topple over. The fixings between the polypropylene seat and the steel frame will be tested, to ensure that it does not break easily. The quality of colour and the spray painted finish of the steel frame, will be visually checked for defects. The shape of the seat will be checked with a template, ensuring it is a perfect copy of the original mould. A British Kite mark and a Conformite European symbol will be stamped on to the seat of the chair, if it passes all tests. An administrative system will be set up, to ensure that quality control checks on the production line, are carried out to the highest possible standard. Staff will be trained to carry out quality control checks and to spot defects. Customers will be interviewed regarding ‘customer satisfaction’ and their views on the quality of the chair. The company will submit the chair for testing by British and European standards agencies, thus ensuring the high quality of their product.